Pretty awesome stop-motion video of an old engine being rebuilt. I doubt it makes a ton of horsepower, but it’s fun to watch nonetheless. If the video embed doesn’t work, check out 11 Months, 3000 pictures and a lot of coffee on YouTube. What’s the only way to settle a score of Audi vs Audi? I guess you’ll just have to watch these two RS4’s and find out. …man, what I would give to have this in traffic sometimes. Friday Fun – Ever Wonder how a Differential Works? What can you say? Ken Block, Gymkhana and Hooning just never gets old. This time, they take to the streets of San Francisco reminiscent of the “Escape from…” series from years ago – except this time, it’s legal. Every grassroots racer should be able to relate to the guys in this video. Luckily someone with a ton of talent shoved a camera in their face and documented it – beautifully. The best YouTube video I have seen all year. The new M5 should be hitting your local dealer’s inventory this month. Go see if you can take it out on a test drive like this. I have been informed that the Ken Block RC Car from last week just isn’t gonna cut it for the big Hoonigans. The big boys need to play with big toys.. and in the world of RC cars, there’s none bigger than the Traxxas XO-1. “What’s the big deal about this RC car” you say? How about the fact that it hits 100 MPH. Yeah, one-zero-zero, miles-per-hour. Powered by a ‘Big Block’ brushless motor, two 3S 5000mAh LiPo batteries and an AWD system; the Traxxas XO-1 will hit 0-60 in 2.3 seconds and continue on to 100MPH in a mere 4.92 seconds. Advanced control is provided with a remote that interfaces with your iPhone (or iPod touch) to feedback speed, RPMs, temperature and even telemetry information ensuring you have the fastest and most advanced RC car on the market. Santa – are you reading this??? Long time Honda tuner Jeff Evans managed to do two extraordinary things this weekend: (1) pilot his 950HP Integra to a class record 8.98 @ 167MPH, and (2) walk away from a wreck at close to that speed. Autoblog has more details on the crash and Evans Tuning has more details on the car. 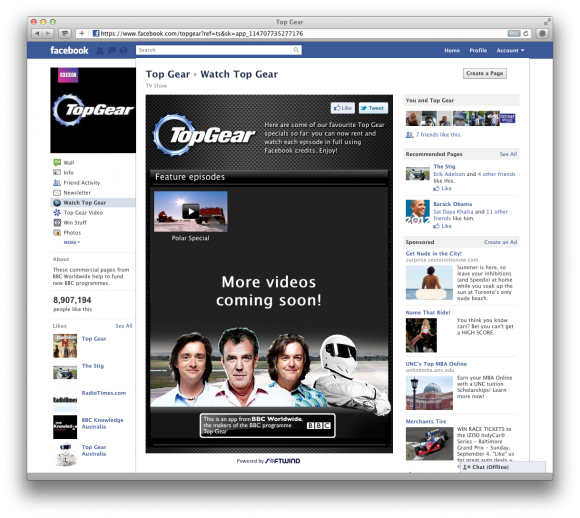 The BBC has just released a new Facebook app that allows you to watch full length episodes of Top Gear in your browser. Legally. The Polar Special was the only episode available when I looked, but apparently more videos are coming soon. I wonder if they will add the Tesla episode?